Lasercut Oldhammer Stonethrower Templates for the Benefit of Humanity. 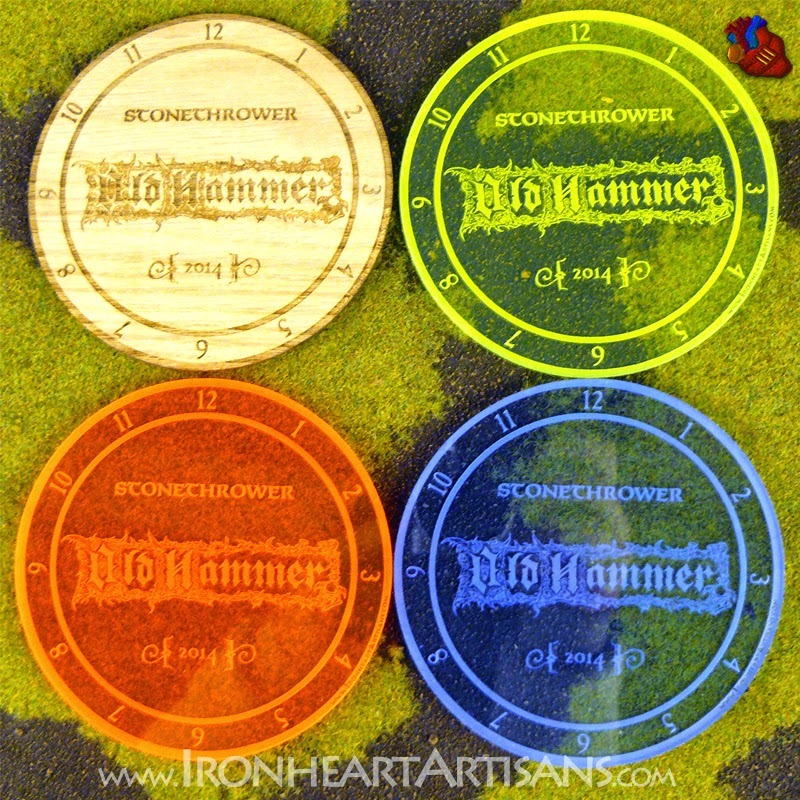 Blake Shrode of Oldhammer in the New World got in touch about using my Oldhammer ov Khaos logo for some templates to celebrate the inaugural Oldhammer convention in Naggaroth the New World North America. 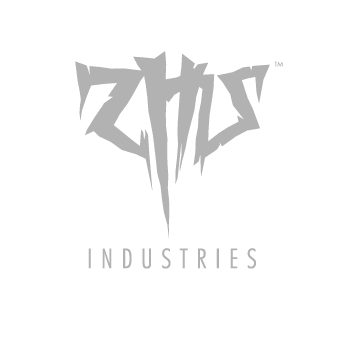 As well as featuring my sanity-destroying Oldhammer ov Khaos logo on a 5" template with numerals in Casablanca Antique and title in Feinen, perfectly in keeping with the typographical standards of 3rd edition Warhammer. These have been Expertly laser-cut in plastic and wood by the rabid laser-blasting tinker gnomes at Iron Heart Artisans . Blake has descided to release these to the general public each template costs + $10 + $4 shipping - payment and order (noting which colour(s) you would like) to bshrode13@hotmail.com read more about it here. Orders placed before November 9th will have my modest remuneration for artwork donated to Project Alchemy - an Oldhammer and Collecting Citadel Miniatures project set up and run by eminent Oldhammerists Jon Boyce, Tony Mansfield, Steve Casey, James Craig to raise money for UNICEF. So get in quickly! Not interested in lasercut stonethrower templates for Old School Wahammer? What's wrong with you!?! Probably nothing. So go and have a look at some of the amazing old stuff that you can win by donating to Project Alchemy , original artwork from Ian Miller, the original artwork of Tony Acklands awesome demon summoning template from warhammer 3, some superbly painted old miniatures, rare publications and more. The first five (the slightly more 'exotic' characters may be unlocked later): Spoony, Welard, Rodders the Deserter, Mike the Spike (my names, not the official ones) made it into the first gang. "Concept Art" means different things to different people, there's a tendency (especially with Kickstarters) for it to mean "final design that the sculptor will produce" and so the concept art really needs to be tightly finished. Tre' doesn't quite work like that, but rather develops his own take on the idea, so the drawings for working purposes just need to be a seed. Although that does mean for marketing purposes they don't really sell the idea in the way a more finished drawing does, neither does it constrain Tre from embellishing and reposing as he sees fit during sculpting, and besides he know his world, how shoes are made, what hats look like, and doesn't need to be instructed on details like that. Without being sycophantic, it is quite amazing how Tre's sculpting brings these tiny scribbles to life while emphasising the essence of the character. For inspiration well of course Warhammer Fantasy Roleplay 1st early careers. 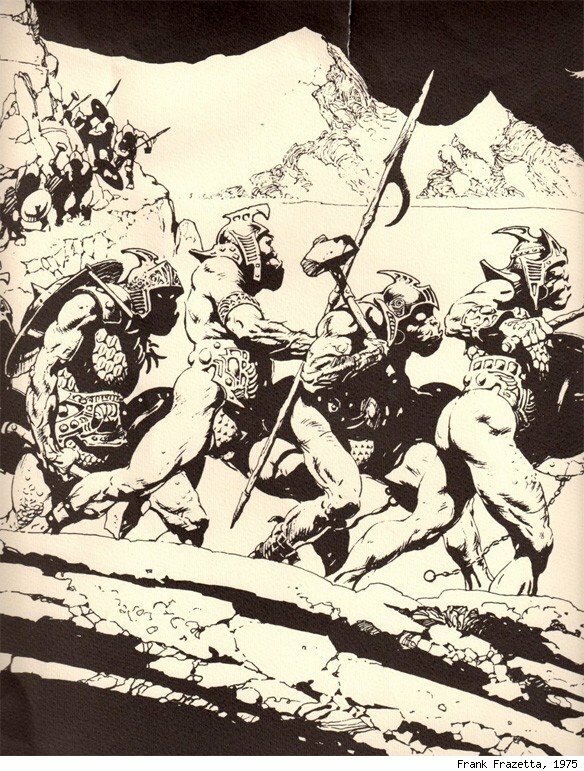 N2 The Forest Oracle, by Carl Smith, arguably the worst written D&D module ever , contains this jem describing brigands: "It is plain that they are not soldiers by their haphazard way of walking. They are neither tarrying nor running. They do not seem to be joking loudly or singing as they advance". Yes indeed! But more importantly, the renaissance and medieval art (Bruegel and Bocsh most significantly), hopefully grounding them in a realistic fantasy milieu, and a bit of The Water Margins. Gamewise, well for wargaming these guys make great conscripts / peasant levies for medieval armies. 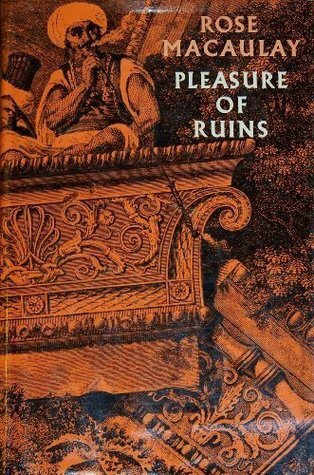 For role-playing, D&D low-level chaotic/neutral/evil characters, the kind of guys busy catching rats in the sewers catching syphilis and getting bitten by small vicious dogs, traipsing around the countryside stealing the lords sheep, going down the dungeon, killing things and taking their stuff. Low morale (and low moral!) henchmen, hired for a few copper-pieces and likely to turn tail at the first sign of danger. 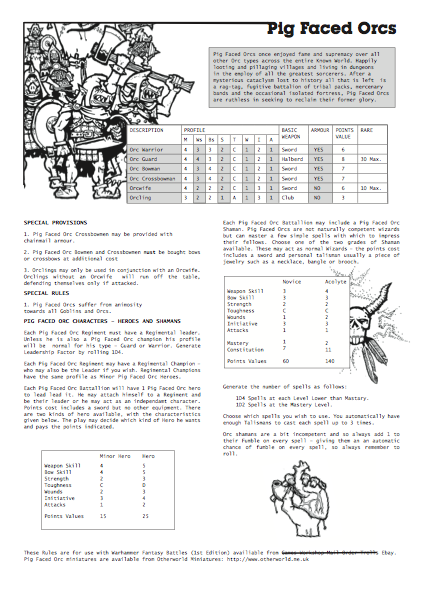 And of course, they make classic WFRP murderhobos. The season comes but once a year. 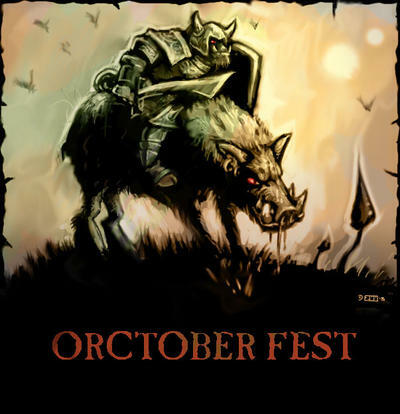 Orctober! Orctober is a month long celebration of Orcdom across the whole of the internet, instigated by Orcmiester of ceremonies, Erny. 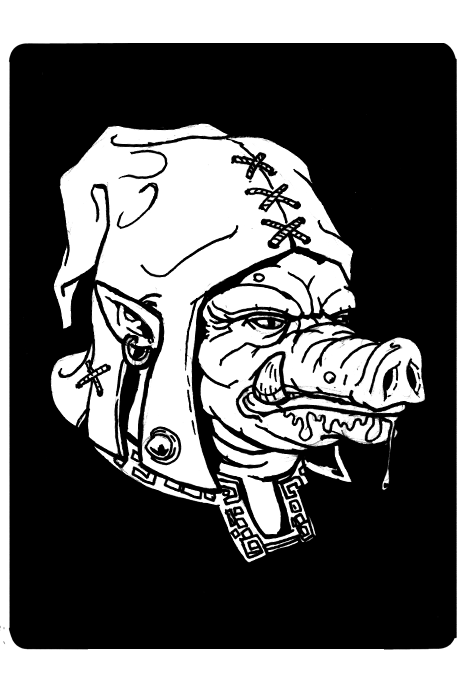 And previously I'd written on the pig faced goons in sleeping beauty, which was something of a speculative musing on Gary Gygax's pig-faced orcish development. Prompted by Matthew Sullivans excellent short history of the development of the Orc over on Oldenhammer taking Tolkiens description through miniature designs from Jes Goodwin at Asgard to the Perrys at Citadel, and the development of the strong, jutting lower jaw in their Fantasy Tribe Orc miniatures (which still dominates the Warcrafthammer Ork of today) - which in comments I referenced to Frazetta's 1965 Lord of the Rings artwork. Now, I love that painting, but hadn't looked at it for quite some time. And it reminded me of something. Hey King Ploobis, got any cats? 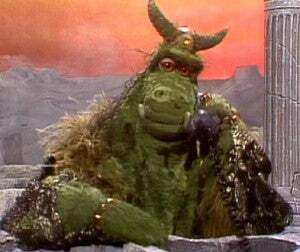 King Ploobis, from The Land of Gorch. 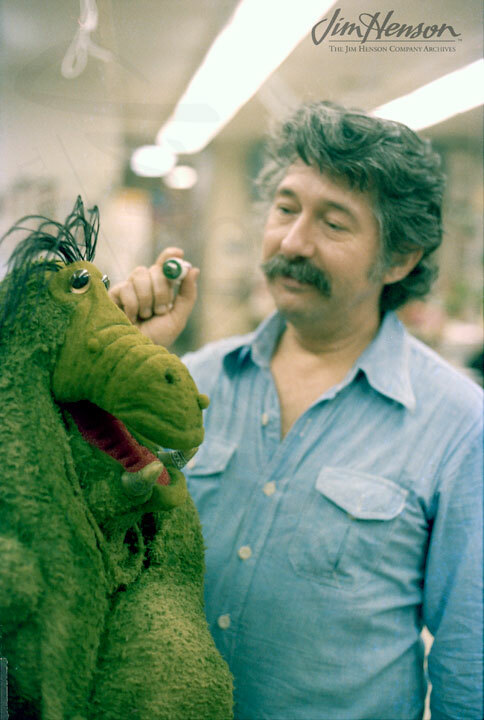 a puppet based sketch section appearing in 1975 on the long-running American comedy show "Saturday Night Live" and led by Jim Henson. 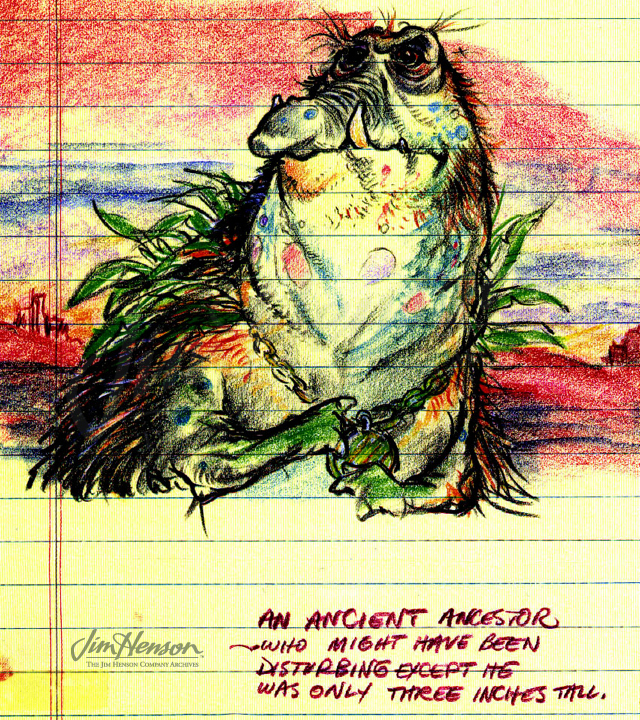 Now, I've speculated that the origins of the Fimir are, in part, owed to Skred from The Land of Gorch (by way of Froud / Alan Lee) and briefly speculated that Pig Faced Orc might owe, in part, its design to King Ploobis. Purely visually, the key similarities shared by Ploobis, Hildebrant and Sutherland and are the motif of the forward facing nostrils, the long, wrinkled or ridged nazal bone area (much more exaggerated than a rel pig, which is only ridged at the snout end) and prominent lower jaw tusks, and thin, droopy lower jaw with slightly sagging lower lip. 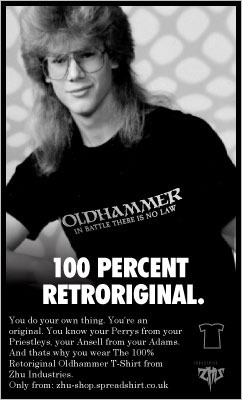 Listening to an interview with Tim Kask - an important contributor to early Dungeons & Dragons, when out of the blue he mentions he had been influenced by Saturday Night Lives "Land Shark" skit when inventing the Bullette (based on a plastic toy) and alarm bells went off. 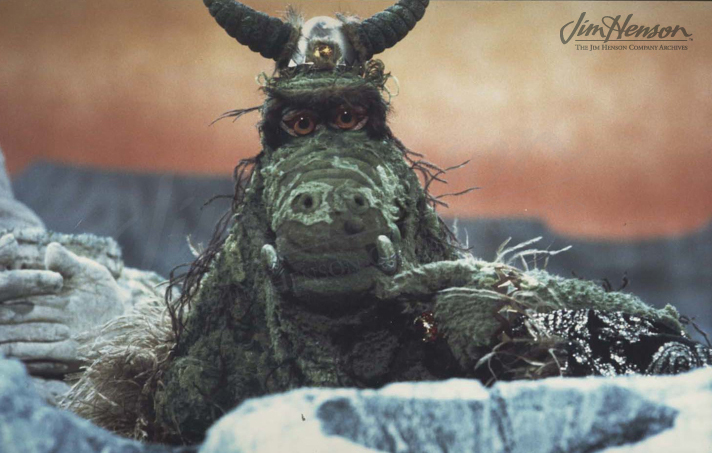 The Land Shark appeared 3 times in series 1, which is when the Land of Gorch was broadcast. So I asked Tim whether he remembered The Land of Gorch, and yes he did (in fact saying he'd recently added an NPC to an adventure based on one of the old muppets). 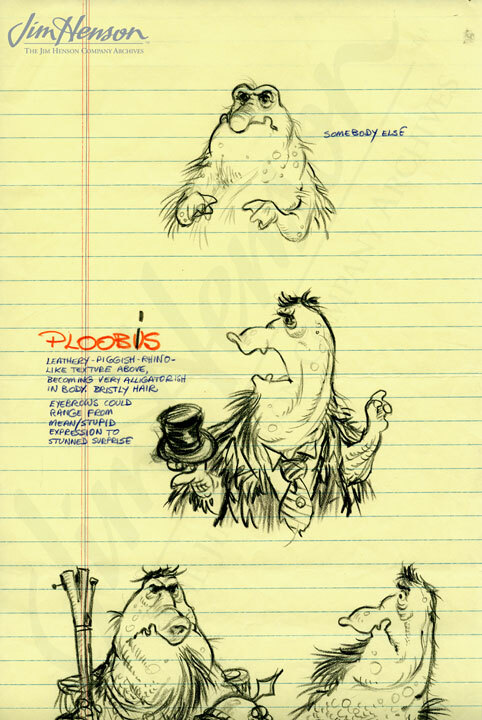 So certainly Tim was aware of Gorch, and perhaps it was part of the wider milleu that TSR was part of back in the day. Were the Hildebrandts, or Dave Sutherland also tuning in on a Saturday night, and picking up some muppet vibes who knows? but it looks likely to me. The D&D toon spawned some dreadful 4" bendy plastic toys, that no amount of misty eyed nostalgia can redeem. Infact the White Dwarf letters pages of the day were filled with vitriol at TSR for selling out, so nostalgia is unlikely to be tinted with anything other than righteous scorn and derision in this case. You could actually buy these. In shops. No. Really. For Money. These are fantastic figures, and to be frank, other than coming across an old copy of the PHB one of the main things that got me back into gaming after a 20ish year hiatus. 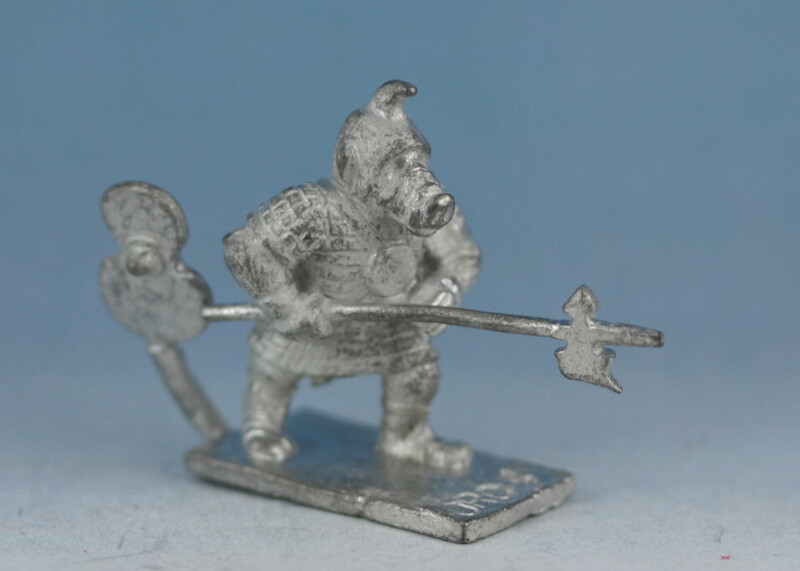 Then there are Spooktalkers absolutely sublime renditions of Pig Faced Orcs in 2014, based on Grenadier models, with snouts attached. 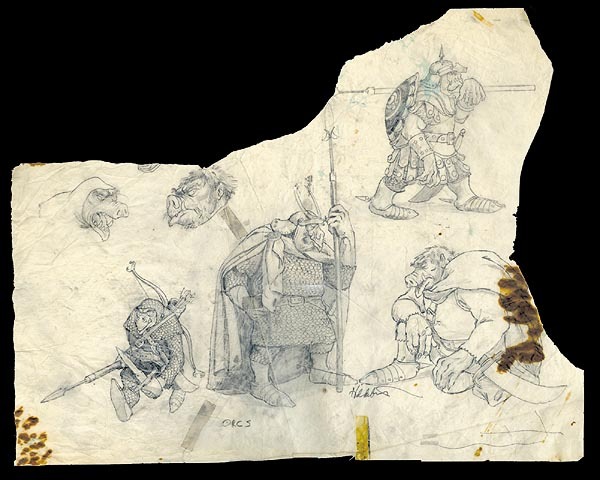 More can be seen in his blogpost: The Orcs that Never Were and well worth a look. And more recently, these two Pig Faced Orcs battling a Slime Eater beneath the Cityport of Kharé, for Otherworlds forthcoming Skirmish game. 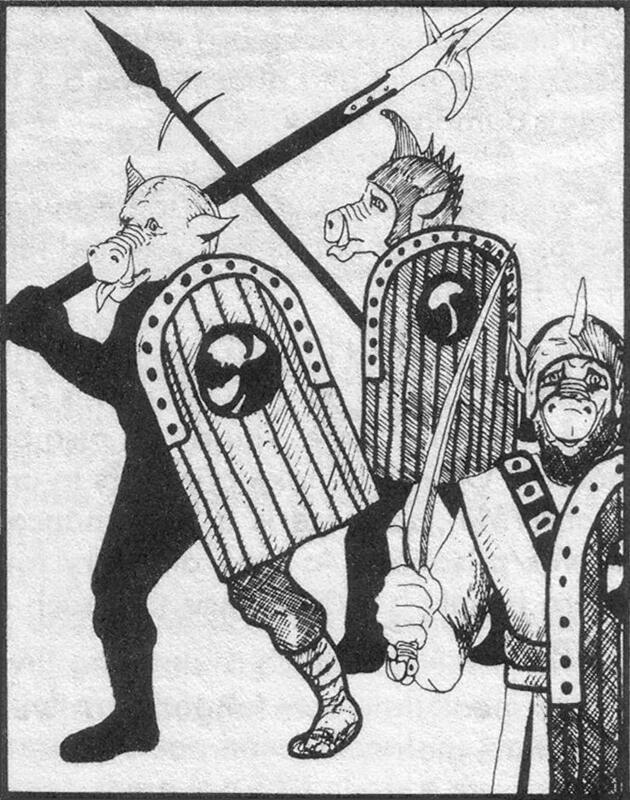 So maybe it's time to drop the Pig Faced, and call these guys Ploobisian Orcs.